Electric fences aren't usually conveniently located next to a 240 volt mains outlet. So, most energisers are designed for use with 12V lead-acid batteries. They work really well - until the battery runs out! Lugging a big, lead-acid battery home across the fields to recharge it is hard work. Luckily, sweaty armpits are easily avoided if you use a solar panel to keep the battery topped up! Most electric fence energisers are extremely efficient - so you can keep the battery topped up with quite a small panel. 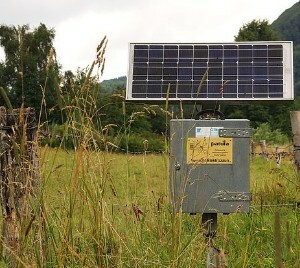 For a standard 0.5J electric fence energiser, a 5W solar panel is quite sufficient. It's best to use a solar regulator between the solar panel and the battery to prevent the panel overcharging the battery. The wiring is extremely easy - you simply have two wires going from the solar panel to the solar regulator, and another two from the solar regulator to the battery.